There are sins we cannot run from. We cannot hide from. Sins that do not stay in the shadows. Sins like those that forced one man to roam the earth for eternity. But since his biblical indiscretion the world has birthed more Sin. Greed. Wrath. Gluttony. Laziness. The world has fallen ill from the darkness of men’s hearts and it is not being looked down on from Up High with pride. But will frustration and anger. While one man roams the world in misery and sin, lost within a world that seems to break more and more each day. Another is just setting out. For change will come. Talk about bleak. Cavemen, the mythos of Cain (Cain and Able, Genesis 4) and a world lost in delusion and selfishness. 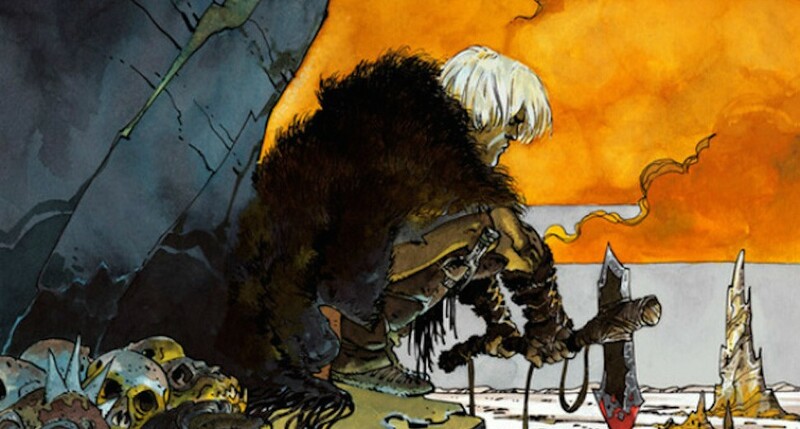 Jason Aaron (Thor: Goddess of Thunder, Marvel) weaves a tale of the End of Days with a shiny light deep… deep down a future tunnel. A mystical world of the Bible mashed-up in reality. But, of course, this mood is nothing new to Aaron. With titles like Men of Wrath (Marvel/Icon), the story of a paid assassin sent to kill his own son. Or Southern Bastards (Image Comics), a close-to-home-style tale of a small southern town handicapped by drugs, lawlessness and football. Aaron shines brightest telling stories based in fact, real life and personal experience while piecing it together with tall tales, incredible imagination and myths we all grew up with. Like many great creative minds, Aaron took advantage of previous success and collaborated on this Bible-based story with Scalped (Vertigo) artist, R.M. Guera, whose flexible style thoroughly fulfills the emotionless wasteland and physical anguish of the World at its Specific place in time. Then, add on the mild color pallet of Giulia Brusco (also on team-Scalped, guess when you have a winner! ), and desolation could not look more lonely and beautiful. With two lovely covers from Guera and JOCK (Wytches), this new title from Image Comics is worth the pick-up! 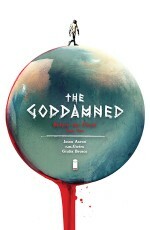 Already selling out, The Goddamned #1 arrived on store shelves on November 11th. Make sure to stop in and grab a copy from your Local Comic Shop!